Do the thoughts of fried bheja (brain), kaleji (liver), and paya (trotter) send your taste buds into a frenzy? Then, the city’s many military hotels (a Bangalore institution actually) will please you with their carnivorous menu. Military hotels have a long history in the city and are known to be small, decrepit places serving largely meat dishes of a surprising array. Service starts as early as the crack of dawn and no one sitting at the tables here thinks twice of diving into a plate of biryani first thing in the morning. 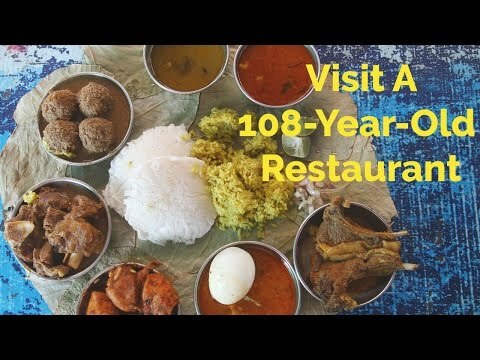 We take you on a guided tour of a dining tradition that is now part of Bangalore’s culinary history. With over a 60-year history and closely guarded recipes, Ranganna Military Hotel is where you should begin your initiation into military mess food. The Kheema Ball Curry and Thale Mamsa (head meat) Fry are just some of what you want to start with. End with a Mutton Palav (a biryani that is more like a pulao) that will seal the deal of happiness. Of course, the tiny steel glasses of steaming rasam that round up every meal are a must. An insider secret — Ranganna handpicks every piece of meat and all the masalas are ground fresh every day. Food here is served on patris, dried leaves stitched together to form a plate. You can get your breakfast fix as early as 6am and make sure that it begins with idlis and Kheema Curry and is followed up with Mutton Palav. All of the meat fries here are strong on the chilli or pepper factor. Narrow stone benches and tables allow only two people to sit together here. When the plate of palav hits your table, the pepper aroma alone can make you go weak in the knees. The top pick for military hotel palavs, this is one place you don’t want to miss. Of course, the usual meat fries will add to your meal here. Many a happy soul makes a hearty breakfast of the Donne Chicken Biryani that is served here. The crowds are something to look out for but if you are good with a little jostling around, you will get by. The biryani is served in donnes (leaf bowls) shaped to look like little boats. You get your biryani with a little gravy and some pachadi (raita) on the side. Haul your loot up to the first floor where you can choose to stand, squat, sit or fight it out for the long bench. Make sure to carry along a thirst quencher as the biryani is spicy here. The Mutton Curry and Ragi Mudde are the top orders here, followed by the Bheja Fry. The Boti Masala, as well as the Mutton Chops score high on the popularity charts as well. Gowdru is known for its ability to churn out the best dishes made up of some delicious spare parts. Commandeered by the late owner’s wife, Rajanna Military hotel is like a well-oiled machine. Once you are served, the delicious Mutton Korma, Ragi Mudde and Kaima (kheema) will hardly have you looking up from your plate. No matter which strata of society you are from, the great food here is a perfect leveller. When the first plate of Ragi Mudde and spicy Mutton Chops curry hits your table, everything will seem much brighter. The Bheja Pepper Fry gives you a mélange of textures and flavours — soft, slightly crisp, hot and spicy. Boti Fry, Nalli Masala and Chicken Fry are other must-try dishes here. A name that has managed to build a huge recall factor for itself. Timing is the key to getting a seat and a donne of palav here. Besides the palav that is made in batches to cater to hungry hordes, a few limited meat dishes a day make their appearance. Service is brusque and plates are laid with rasam and pachadi served in quick succession. Be ready to have people stare you down while you eat, waiting to slip into your seat as soon as you give them an inch. A thick skin and good appetite are what you need to take here. While most military hotels don’t offer you pork, there are a few that do, and this is one of them. It claims to serve Coorg style preparations in the tin sheet covered space that it has. Brick benches and wooden tables form the seating here. The Ragi Mudde has steamed rice blended into the mix making it wholesome, and the Pork Pepper and Chicken Curry are dishes you must try here. Apart from the usual chicken and mutton dishes, there is Boti, Thale Mamsa and Bheja Fry to be had here as well. Sundays see the restaurant dishing out Kaal soup (paya or trotter soup) with Thatte Idli, and Kaima Gojju. The menu here is rather small each day, offering one or two meat dishes along with palav. On most days, you may find the gravies suspiciously the same, but if you are in the area and want to tick off a name from the list, this place can make for a satisfactory lunch.